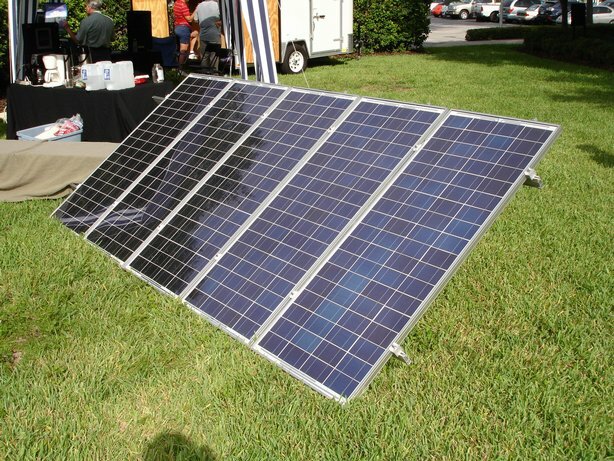 I attended a renewable energy expo at UCF and learned some interesting things about solar energy. With energy prices on the rise, everyone is thinking about how to get a handle on this. Solar Energy is a renewable energy source that is good environmentally and is also cost effective - especially now with the state rebate and federal tax credit available. If you have a sunny southern exposure, solar might be right for you. - The ICS collector acts as a "Preheater" - will heat the cold water makeup to existing Hot Water Heater so your hot water heater will not run as much. - Can be mounted anywhere (roof, ground) - just needs to be in the sun! Run by the water pressure in the house. - More info from the manufacturer. 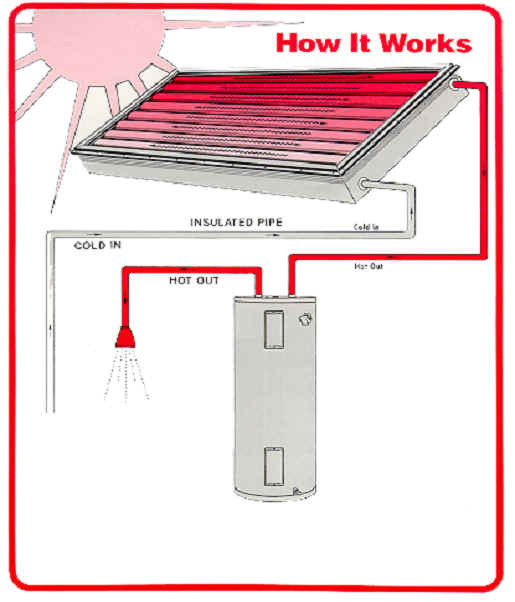 An Active Solar Hot Water Heater uses a pump to circulate the water from a separate storage tank to the collector. There is a control box that turns the pump on when the collector temperature is 7 degrees higher than temperature at the bottom of the storage tank. 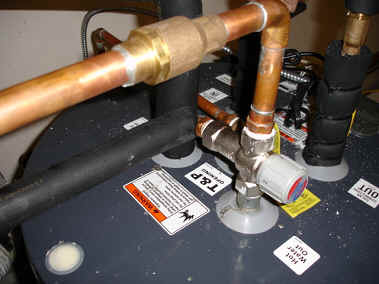 A typical installation would remove your existing electric hot water heater and replace it with an 80-gallon hot water heater that uses an electric heating element during times when the solar would not provide all of the hot water needs. Although this is a more complicated system, it is more efficient than the passive solar heaters by recovering more heat from the sun. The collector is also much lighter than the ICS collectors since it doesn't have as much water in the collector. For additional information on Solar Hot Water and to calculate your estimated savings click HERE. 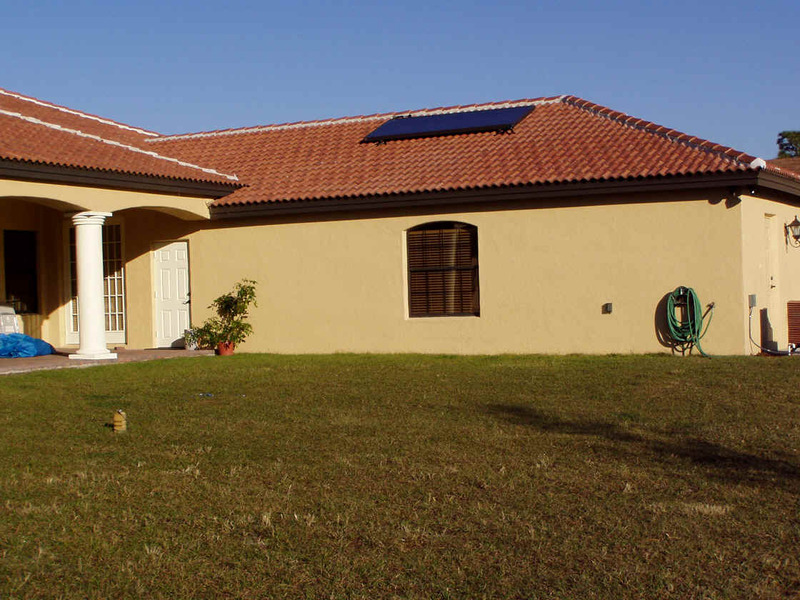 To view the Florida Solar Energy Center On-Line Side-by-Side comparison of various hot water heating methods, click HERE. The cost for PV, producing electricity from the sun, is still costly. However, even at these high prices, the demand for PV panels today is very strong and has resulted in significant lead times once ordered. To view all the solar credits available, click HERE. On November 15, 2006, Paul and Lori Allen installed the "active" solar hot water system in their home to replace their 19-year old LP-gas hot water heater. So here's the bottom line if you were to install an Active Thermal Solar System (UPDATED based on 4/2008 costs):. 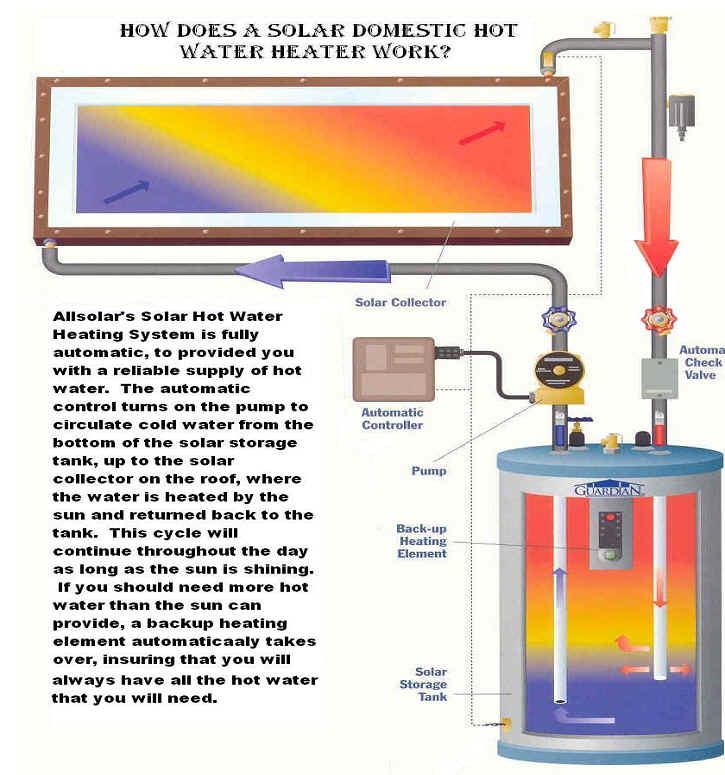 (Note: If you were planning on getting another hot water heater anyway -- then you would deduct the installed cost of the conventional hot water heater from the net cost -- this would make the solar option even more attractive). 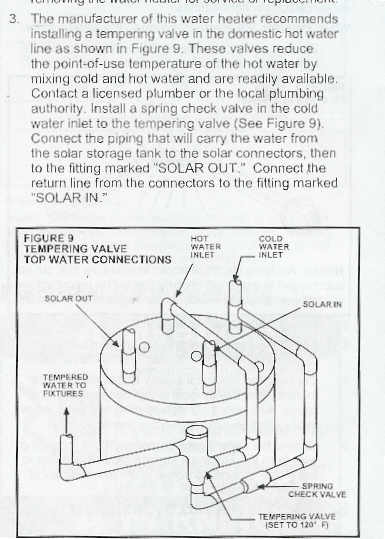 "How much does the electric backup heating element use in the solar hot water tank"
June, 2008 - 8 Kwh ($0.88) Florida Sun is providing virtually all the hot water! 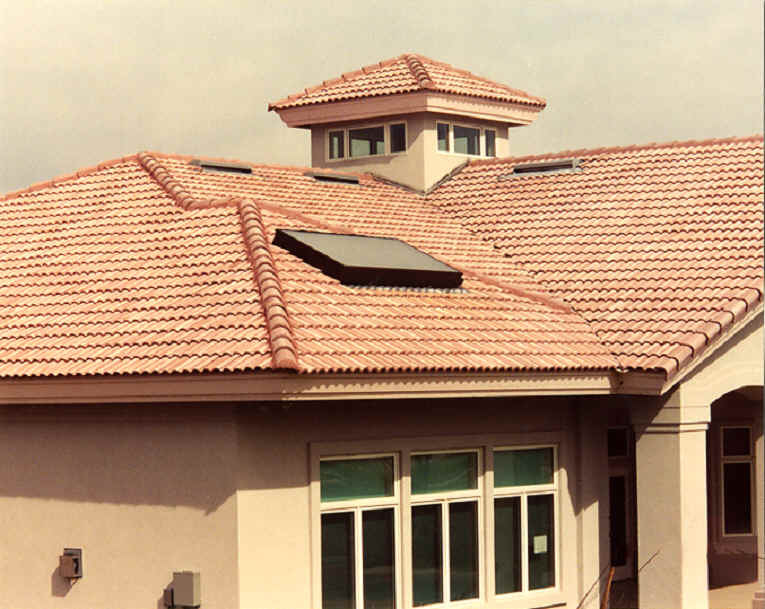 The State of Florida Rebate will pay for about 1/2 the cost of the PV system. Typical installed cost is $10-12/watt or $10,000-12,000/Kw. To max out the matching state rebate, a 5KW array could be installed. So the estimated installed cost would be $50,000-60,000. Considering the 5KW PV system, the State of Florida would rebate $20,000 and the Federal Tax credit of 30% on the balance would reduce the cost by another $9,000-$12,000.. So the 5KW system would cost the owner $21,000-28,000. 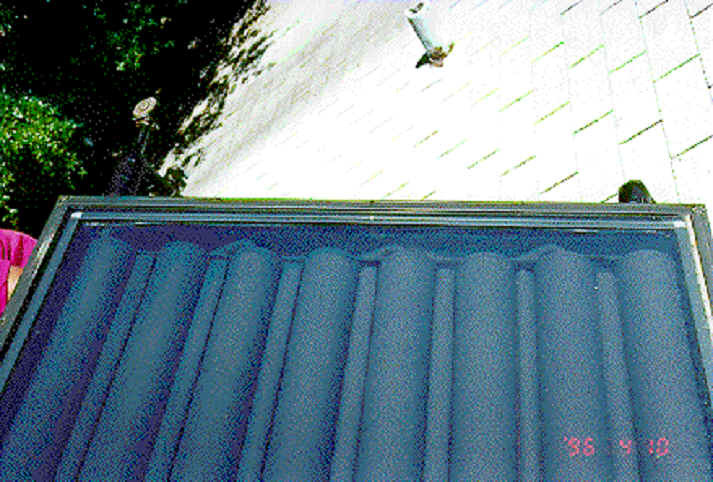 To obtain this rebate, the Owner must purchase and install the system first -- so there would be a significant up-front cost associated with this installation. Of course, a smaller system could be installed too. 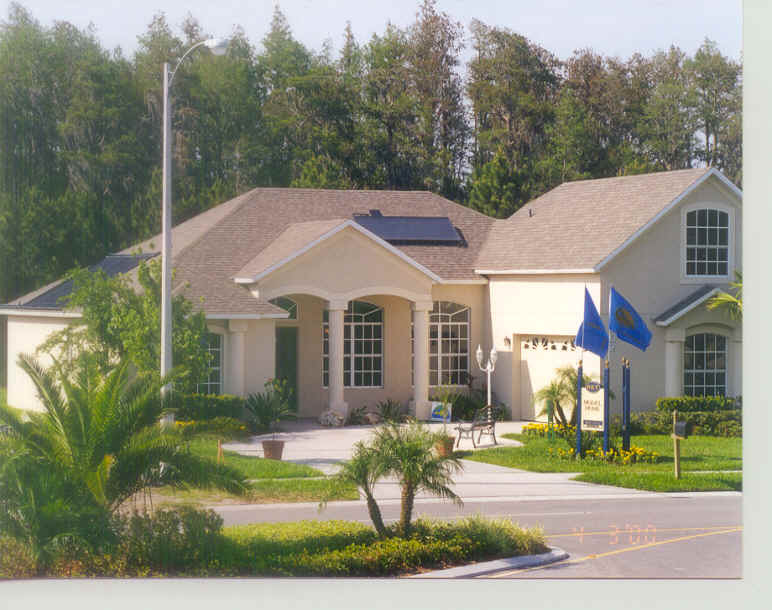 However, the State of Florida has set that 2KW be the minimum size that qualifies for the rebate. The typical installed cost is about $10-$12 per watt. A 2 KW Array is estimated to cost $20,000-$24,000. State rebate would be $8,000. Federal Tax credit would be $3,600-4,800. Net cost of the array would be $8,400-$11,200. These are estimated prices only. 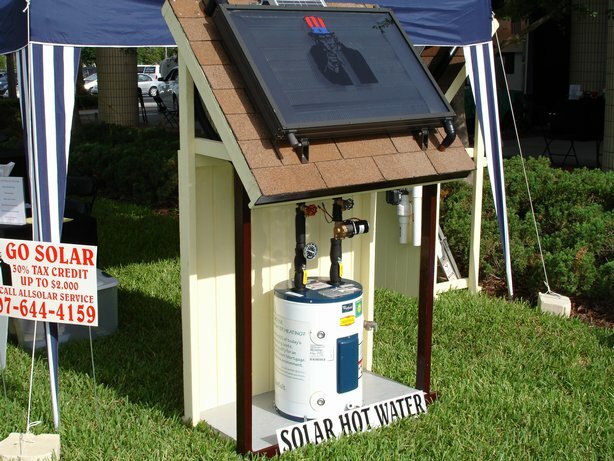 Note that for the State of Florida solar rebate - you can apply for rebates for both Solar Hot Water and Solar PV. So if you want to do the PV system and then want to put in the solar thermal rebate you can apply for both rebates separately. For the Federal tax credit - if you were to install both the Solar Thermal and PV, you can take $2,000 for both - there is no limit for the 30% tax credit anymore. You can carry forward the unused tax credits to future years. Contact Paul Allen at ahpoa4@yahoo.com if you have additional questions. This site is hosted for FREE by . Click here to get your own Free Website!